He was prepared to put his life at stake for the cause of liberty and democracy. "Do not go where the path may lead, go instead where there is no path and leave a trail," said American philosopher Ralph W Emerson. If one looks at the life and times of George Fernandes, one would readily endorse Emerson's saying. 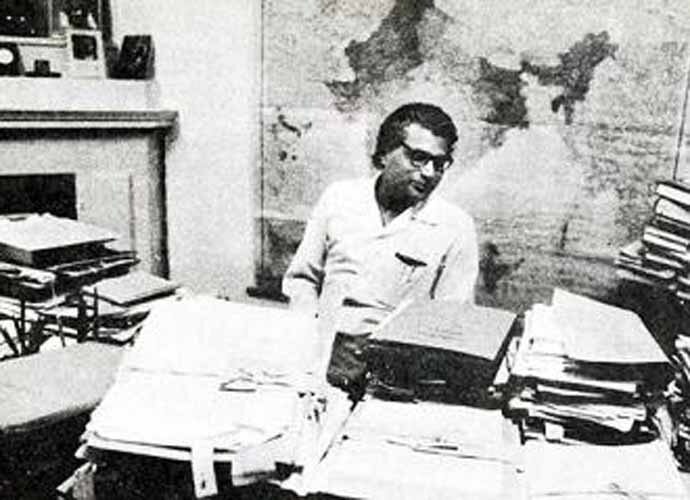 George Fernandes did not traverse the well-trodden path. Instead, he blazed a new trail by organising the hitherto unorganised sections of the oppressed and dispossessed sections of society. 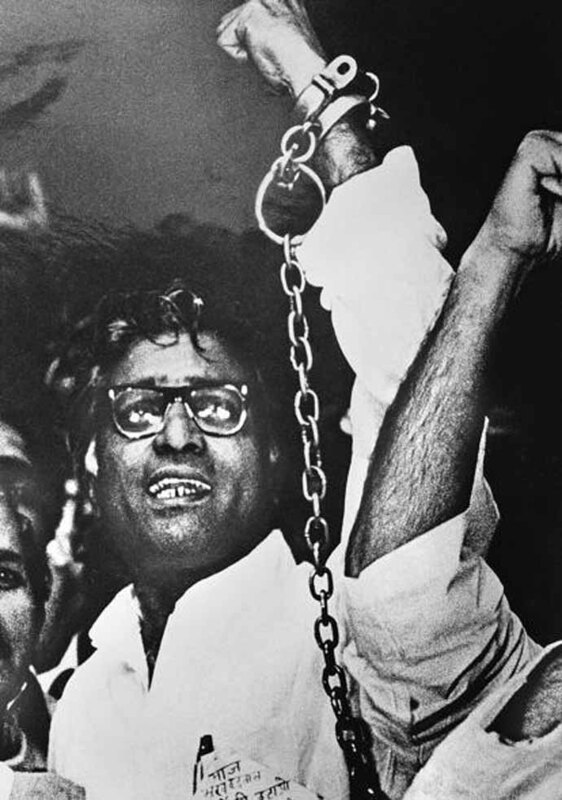 I have watched George Fernandes growing fast from a city-level political and labour leader to a leader of national stature. I am glad that in some way, I also have been a part of this process. I recall my first encounter with him in the early 1960s when I was an impressionable schoolboy and he was a daredevil agitationist, who threw himself on the railway tracks to stop a train during the bandh, which he had declared himself in support of the central government workers, who were on a nationwide strike. George, who always showed great physical courage, jumped on the tracks at the Dadar station of the Western Railways and was mercilessly beaten up by the police. He was immediately detained under the Defence of India Rules at the Nagpur Central Prison. He was released after a considerable time and he immediately bounced back into action. He restarted his political work with the municipal and BEST workers. I used to marvel at his tremendous stamina as I saw him give a marathon speech for over five hours at a rally of municipal workers. His stamina would be the envy of seasoned sportsmen and athletes. His hotel workers' rallies would be held at the Azad Maidan and they would start at 1pm and he would address them till the break of dawn and retire to his Pan Gali residence for a mere two or three hours to get back to the negotiation table to seal the deal in favour of workers with the municipal commissioner. As a wonderstruck or star-struck teenage observer, I have seen and participated in his election rallies during the historic 1967 general elections when he defeated the formidable leader, SK Patil, who was reputed to be the Tammany Hall politician, who ruled over Bombay. George earned the epithet of the giant killer which stuck throughout his career. He entered the fourth Parliament which had big guns such as Madhu Limaye, Atal Bihari Vajpayee, Nath Pai, Hirendranath Mukherjee, HV Kamath, Surendranath Dwivedi and Hem Barua. George led many agitations during his first tenure in the Lok Sabha. He was always a fiery speaker who could literally ignite the audience into direct action. Various workers' agitations and nationwide actions by landless labourers and small farmers also needed his leadership and oratorical skills which he readily made available. His communication skills were absolutely novel. I remember how he took out a newspaper advertisement clipping from his pocket and read out how a pet dog's birthday was celebrated with great fanfare by a state minister when there was famine like situation in Maharashtra. Once, he issued a statement claiming that the Central Bureau of Investigation had, on instructions from the then PM Indira Gandhi, raided the residence of the incumbent chief minister Vasantrao Naik. Naik, of course, denied the allegation. While doing so, Naik called George a "mamuli aadmi" (an insignificant or non-descript person), who need not be taken seriously. George seized the opportunity and accepted that he was a non-descript person, who had no wealth, no bank deposits, no black money stashed abroad in Swiss Bank accounts. Thus, he turned the tables on Naik. His interventions and questions in the Lok Sabha regarding the nefarious activities by the smugglers earned him the wrath of Haji Mastan, who had sworn to defeat George in the forthcoming Lok Sabha polls. Mastan's cohorts went around the Muslim areas in south Bombay and told the Muslim population not to vote for George, who had allegedly visited Israel which was an anathema to Muslim voters. George lost the election but not his spirit. He swung back into action and became the chairman of the united Socialist Party in August 1971. I and my colleagues in the youth movement were firebrand secularists. We resented the presence of priests, mullahas and bishops in the public life. We were firmly behind Hamid Dalwai, who had the guts to take on the Muslim orthodoxy. For us secularists, separation of religion from politics was the cardinal principle. Dalwai would publicly praise George for not mixing his religion beliefs and politics. When the Pope visited Bombay for the Eucharistic Congress in 1965, George was on the other side of barricade with the camp which told the Pope to take notice of the poor and dispossessed people irrespective of their religious beliefs. George always led from the front. In 1967, the SSP had marched oto the Parliament to raise the grievances of poor farmers and the unemployed youth. The police in Delhi unleashed a brutal lathi-charge on the morcha and George was their prime target. Pannalal Surana and PB Samant shielded George from the cruel police brutalities and bore the brunt of the police attack. George was energy and enthusiasm personified. He would address hundreds of public meetings and in the end make an appeal for funds and people would rush to the dais to personally hand over their contributions. I recall one Parsee gentleman, who was probably a BEST worker who would make a mite contribution, at every meeting. His generosity was such that even George felt embarrassed. George had a phenomenal memory as far as names and faces were concerned. It is really an irony of fate that such a person is now a dementia patient. He has been a linguist who speaks many languages and dialects with astonishing fluency. Which is the first Marathi book which he read? It was Shyamchi Aai, a highly sentimental novel by the socialist saint Sane Guruji. George read it during his first prison term which he served at the Arthur Road jail. From the beginning, George has been a doughty fighter. He fought resolutely and tirelessly for the causes which he believed were noble. One remembers how he and Babu Mumbarkar staged a satyagraha for the removal of the horse riding policeman's statue which was called Kala Ghoda by the people in Bombay. Ram Manohar Lohia gave a call to do away with all the vestiges and symbols of the colonial power. Kala Ghoda was one of them. Similarly, English was the medium for the legislature as well as municipality. In the Bombay Municipal Corporation, George supported by Mrinal Gore, Shobhnath Singh and others took the lead in using Marathi as the language for day-to-day work. This was way back in 1961, much before the chauvinist Shiv Sena was born. The purpose and the principle was the use of people's language instead of the language foisted on us by the colonial power. Although George worked like a machine for long hours, there was a touch of human warmth in his relations with his co-workers and comrades. Lotlikar, a party worker in the union office, was once spotted by George puffing a cigarette. George summoned him and admonished him for smoking. Lotlikar, who was thin to the point of being frail, was thrilled that George showed so much concern over his well-being and health. When George read my writings on Hindustani classical music published in The Times of India, he was happily surprised and wrote an inland letter expressing his admiration. I was, naturally, touched by this gesture. George was the chairman of the unified Socialist Party when Peter Alvares, his senior party colleague was the chairman of the All India Railwaymen's Federation. George contested the election against him and won. He became the unquestioned leader of railwaymen. Leaders of the erstwhile Praja Socialist Party were aghast that George could commit this sacrilege. Technically, or even morally, his decision could be challenged and questioned. But politically, it turned out to be a masterstroke. George literally galvanised the railway workers from all over the country and led the biggest countywide strike which began on May 8, 1974. Earlier leadership could not have even dreamt about such a possibility. He shared an unusual equation with Shripad Amrit Dange, who was his senior but a rival as far as labour movement is concerned. Both admired each other's qualities. Dange sabotaged the railwaymen's strike in order to please Indira Gandhi, who had the solid support of the erstwhile Soviet Union. On Dange's 75th birthday, there was a grand felicitation function at Shivaji Park for which the then President of India, VV Giri, a stooge of Indira but a former labour leader was the chief guest. George made a memorable speech in which he urged Dange to lead the movement to give the final blow to the system and establishment which was anti-working class. There were many red and embarrassed faces but nobody could contradict George. One recalls that Peter Alvares during a tour of Bihar and Uttar Pradesh. His body arrived in a train and all of us including George were at the VT Station late at night to receive the coffin. George was visibly shaken and made an impassioned speech recalling Peter's services for the cause of socialism and how he was qualitatively different from his fellow catholics, who were toadies of the British rulers. George acknowledged his contribution in the most magnanimous manner. There were many aspects of his personality which were beyond one's comprehension. How could he get pally with Bal Thackeray? He helped Thackeray during his early difficult days. He came out full throttle to defeat George during the 1971 Lok Sabha elections. George was a sworn enemy of the Emergency imposed by Indira Gandhi. Thackeray was one of the first Opposition leaders to join the pro-Emergency bandwagon in order to avoid arrest and detention. One can appreciate personal friendships. Yet, they do come in the way of one's political and ideological struggles. Similarly, one could never understand his defence of the Morarji Desai regime in Parliament in July 1977 and subsequent resignation on the very next day. What kind of a summersault was it? He was allergic to Lalu Yadav and his caste politics which is understandable. But how could he align with the party which deliberately communalised and polarised the voters in Gujarat and then the rest of India? The silver lining was that he had advised then prime minister Vajpayee to impose President's Rule in the riot torn Gujarat and call in the Army to restore law and order during the 2002 riots. Not enough attention is, however, paid to his work as India's defence minister. His fight against the Emergency and the authoritarian regime is his lasting contribution, which should be cherished. Balchandran, who was a top notch police official, later revealed in a talk that barring spirited fighters like George, Limaye, Mrinal Gore and a few other Gandhians, everybody else, including those belonging to the current ruling party, were eager to strike a deal with Indira Gandhi and avoid imprisonment and escape the hardships. Back in those days, George enjoyed a halo around him like Netaji Subhash Chandra Bose, who surreptitiously fled India and went to Kabul in order to raise an army to fight the British. George moved all over India incognito in a bid to wage a war against the dictatorial regime of Indira Gandhi. A war that would not claim lives, but disrupt communication channels and destroy public property. One recalls the thrill that one experienced as one read his first circular while he was underground urging us to throw lighted cigarette into post boxes as our first mark of protest against the dictator. That is how the democrats protested against the Nazis in Germany. He could remain underground for over a year. Though he could have easily escaped and gone abroad, he did not. He wanted to stay in India and put up a spirited resistance. George, really, had nothing to fear. He was prepared to put his life at stake for the cause of liberty and democracy. That image of George will permanently stay in our minds and continue to inspire us. Author is an old socialist activist and a free lance journalist apart from being a Hindustani classical singer.